In honor of Women’s History Month, I will present little known/under-appreciated women in American history. I’ll aim for one a day. We’ll see how long that lasts. It’s not that there aren’t enough women to write about. It’s that sometimes the days get away from me. Anne Marbury Hutchinson was born and raised in England. She arrived in the Massachusetts Bay colony in 1634 and settled with her husband, William, and eleven of their children in Boston. A devout Puritan, Hutchinson regularly attended church services, and she held religious discussion groups in her home to help other women in the community better understand John Cotton’s sermons. By 1636 those group meets had become so large and so popular that they attracted the notice of civil and religious authorities. Hutchinson posed a couple of threats to Puritan Boston. She presided over meetings that gradually comprised both women and men, and presumed to teach men about the Bible and theology. She criticized Boston ministers for promoting salvation through good works rather than grace. In 1637, the General Court called Hutchinson to appear and answer charges of disrupting the peace of the colony, being in league with a condemned group, and traducing or slandering local ministers. She was found guilty and sentenced to banishment. Next, Hutchinson’s church called her for an examination regarding her beliefs. The ministers declared her a liar and excommunicated her. Hutchinson and a group of her followers, including William and the children, settled in Rhode Island in 1638, then moved on to New York. In 1643, Hutchinson and her remaining family members were killed in a Native American attack. 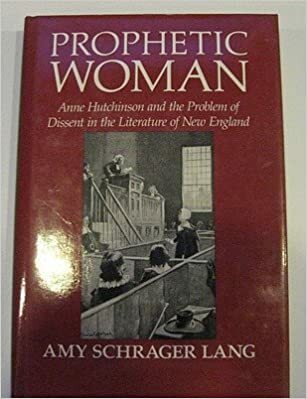 Anne Hutchinson is of huge importance in history, especially in regard to freedom of conscience and speech. Her friend, Mary Dyer, deserves mention too. Thanks for mentioning Mary Dyer. A friend and follower of Anne Hutchinson, Dyer also left Massachusetts. She later became a Quaker. When she repeatedly returned to Boston to preach her faith, Puritan authorities arrested her for her heretical views. Despite imprisonment, despite the warning she would be executed if she again returned to the settlement, after her release Dyer came back. In 1660, the Puritans made good on their promise and had her hung. Both women had a tremendous impact on history, but Rhode Island and it’s founders are ignored in the scheme of things. Anne Hutchinson, Mary Dyer, and John Clarke (possibly his wife, Elizabeth??) have more to do with freedom of conscience and personal rights (beliefs, speech) than any in history. Pretty amazing, yet who has heard of them? Thanks for this. I look forward to the rest of the series.